The Remote Mini Reel is manufactured in Australia, and ensures your work is easier and safer. Assists in safe jetting for one man operation - meaning that the operator has control of the jetter from up to 120m away from the machine. (Jetting machine must be fitted with an unloader valve). 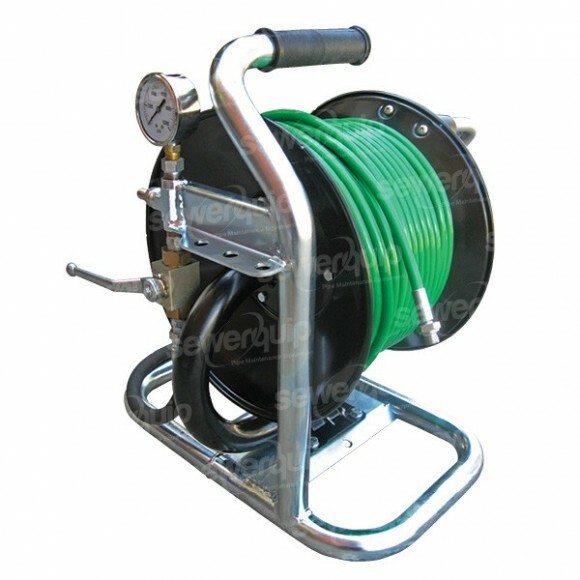 Featuring a heavy duty USA made hose reel, stainless steel high pressure isolation ball valve, a tough zinc plated steel frame, ergonomic design, nozzle rack, rubber grip & an 8500psi SEWERJETT pressure gauge, this reel can fit up to 60m of 1/4" or 50m of 3/8" hose.